Swiss carrier Skywork Airlines has relaunched service between Bern and London City Airport (LCY), saying it was “reviving a tradition” as well as responding to customer requests for a lunchtime departure from the Swiss city. Global Journeys: Forging the Airport Experience of Tomorrow will be the subject of an all-day conference at the Royal Aeronautical Society, London, next Monday (24 April), against the backdrop of aviation as today’s fastest growing form of travel. The prospect of upmarket US low-cost carrier JetBlue venturing into the transatlantic market with routes to Europe will be under discussion at this year’s Aviation Festival at the Business Design Centre in London on 6-8 September when the airline’s president, Robin Hayes, appears as keynote speaker. More than 30,000 visitors are expected in Dubai next week for the four-day Arabian Travel Market (ATM) 2017, which takes place in Dubai World Trade Centre from next Monday, 24 April, and is set to be the biggest in the event’s 24-year history. Heathrow announced good news on the passenger and cargo fronts last week, with the emphasis on the freight side as global British trade at the airport soared in March. Long-time London City Airport resident CityJet has signed an agreement with KLM Cityhopper for not only the eight-times-daily LCY – AMS route but various KLM Amsterdam services to Belfast. Birmingham, Bordeaux and Hamburg. Western hotel groups are continuing their march on the Chinese market with the Hilton Garden Inn brand making its debut in Shanghai. The parent company already operates four other properties in the city. After an extensive renovation and conversion from the Visconti Palace Hotel, the 240-room Le Méridien Visconti Rome, part of Starwood Hotels and Resorts, has reopened with fully restyled interiors. Bookings for International Airline Group’s new long-haul low-cost airline brand Level have “taken off”, with more than 100,000 tickets sold since its launch on 17 March, the company said last week. 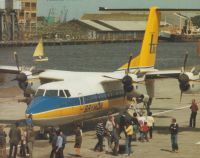 During 2017, London City Airport will be celebrating its 30th anniversary, culminating in the publication of a book commemorating the opening by the Queen on 5 November 1987. In its first full year, the airport saw just 133,000 passengers passing through. In 2017, it will reach towards 5m and serve more than 30 destinations. Back in 1988, you could only fly to Paris and Brussels, neither of which is now on the airport's schedule. The dual carriageway runway underpass into the terminal area has partially opened at Luton Airport just in time for the Easter rush. From the right turn into the Mid-Term car park (free for 15min drop-off) just before the bridge vehicles are into a chargeable area (£3) unless visiting, by previous arrangement, the airport management or easyJet. UK aviation pioneer Sir Freddie Laker and Irish Antarctic explorer Tom Crean are the latest personalities to become tail-fin “heroes” featured on aircraft in the Norwegian fleet. With onboard behaviour somewhat in the news, BTN is happy to hear of Turkish Airlines’ response to the age-old problem of persuading passengers to pay attention to safety briefings. In a word (or two), it’s magic. A comprehensive flight test programme leading to certification and delivery for the Boeing B737 MAX 9 kicked off last week as the aircraft took to the skies above Puget Sound outside Seattle on schedule for its first outing. Growing controversy over the trend of airlines to charge for inflight food and drink that used to be free has led the industry website Cheapflights to produce a survey on average meal costs so passengers can find the best deals. Transpacific services took on a new look last week as Delta Air Lines and joint venture partner Virgin Australia celebrated the expansion of their joint network with the launch of Virgin’s direct service between Los Angeles and Melbourne. Casablanca-based Air Arabia Maroc is to begin flying between Manchester and Agadir from October with a twice-weekly A320 service on Thursdays and Sundays, making Manchester the only airport in the UK outside London served by the carrier. A new lounge operated by the Plaza Premium Group with 25 luxury shower rooms, a lounge and bar area and a new dining concept called Flight Club has been unveiled in Terminal 4 arrivals at Heathrow for the use of both passengers and airport visitors. The first UK-based hotel brand to enter the Cuba market following the thawing of relations last year has announced plans for a property on the Malecón, the popular promenade overlooking Havana Bay. Fares based on the amount of baggage passengers choose to accompany them are being introduced by TAP Portugal in a move it says is designed to give its customers more freedom of choice when buying tickets for intercontinental flights. Further details on the special “four trains, four generations” event on Yorkshire’s railways later this month (BTN 27 March) have been confirmed, with the historic occasion to begin at 06:00 next Sunday (23 April) near the North Yorkshire village of Tollerton.